Spring is here and it's time to get outside. I've already started revamping my backyard and cleaning out the gardens so that everything looks inviting. Sometimes we find it easier just to sit in the house but outdoor activities are very important to your physical health and your mental health. If your backyard is boring, it will be a fight to get your family away from all their electronic toys. Here are ten tips to make your backyard more fun this year! Hang a hammock between two trees or on a hammock stand. 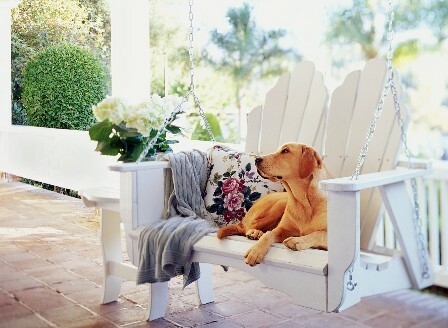 By providing a relaxing and shady spot, your family will be less likely to head back indoors when it gets warmer. Fix old furniture or replace it. By doing some lawn chair repair and adding a few colorful throw pillows to your patio furniture, you'll encourage family and friends to stay around a while. Put some sun tea into some large jars and put them on a table with a couple of cups. Float some lemons in the tea for a dash of flavor and sunny color. Hang a bird feeder on a tree and fill it with seed. The singing of the birds and the activity around the bird feeder will entice your children outside to watch. Start a small container garden for an easy-to-grow vegetable, like tomatoes or beans. Set a wooden ruler near the garden for measuring growth. Keep a small watering can nearby so the kids can water regularly. Hang a little chalkboard on the fence and fill a pail with some colored chalks. Use it for drawing, notes to family members, and to announce when the next backyard cookout will take place. A quick squirt with the garden hose will clean off the drawings. Create a simple tic-tac-toe game out of sticks and rocks. Set it on a table to encourage fun and fair interaction between family and friends. Have a weekly cookout day and invite neighbors to join you occasionally. Make it simple with hot dogs and buns on the grill, some chips and some of that great sun tea you made. Visitors can provide a side dish like fresh fruits and vegetables. Fill a number of squirt bottles with water and set them outside on the patio. It's pretty likely a friendly water fight will break out with lots of laughter. It also feels wonderful to refresh your face with a light mist if you're outside in the sun. Make outdoor time your priority. Children usually follow their parents around and if you're stuck in the house, chances are they will choose that too. Make memories outdoors this year, right in your own backyard!